After recent, rapid strengthening, heavy rain from Idai was responsible for several deaths in central Mozambique. The powerful cyclone is now on a path that will put more lives and property in peril across the region later this week. 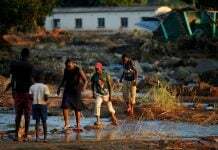 Update: Mozambican government on Tuesday issued a red alert over the tropical cyclone Idai expected to make landfall on Friday, which is likely to hit the country’s central region with devastating storms and flooding rains. Satellite image of Cyclone Idai taken on Monday, March 11, 2019. (NOAA). The cyclone is about to hit Mozambique dangerously! 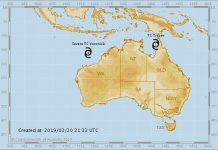 Less than 36 hours after becoming a tropical storm over the warm waters of the Mozambique Channel, Idai strengthened into an intense tropical cyclone on Monday. By the end of the day, the cyclone’s intensity was equal to that of a Category 3 hurricane in the Atlantic or eastern Pacific oceans. Further strengthening is expected, and Idai may approach or reach very intense tropical cyclone status around midweek. At its peak intensity, Idai’s strength may be equal to a super typhoon or a strong Category 4 or even a Category 5 hurricane. Idai is anticipated to strengthen as it tracks away from Madagascar. Rain and gusty winds are expected to further lash the country’s west-central coast into Tuesday, with more localized downpours targeting other parts of northern Madagascar. Seas will further become too dangerous for vessels and small craft across the southern Mozambique Channel as this week progresses and Idai takes aim at central Mozambique. Nicholls anticipates that Idai may weaken some prior to landfall, but residents definitely should not let their guards down. “Idai may still be an intense tropical cyclone at landfall,” he said. Idai can slam onshore with destructive winds and flooding rain in the vicinity of Beira. Life-threatening storm-surge flooding can put coastal communities underwater near and south of where Idai makes landfall. The most dire situation for Beira would unfold if Idai makes landfall just to the north of the city, resulting in the highest amount of water piling up around the mouth of the Pungwe River. Storm-surge flooding may also spread farther up the river, inundating homes and businesses. Residents in Beira, as well as Chiloane, Nova Sofala and Chinde, are urged to closely monitor the track of Idai and make the necessary storm preparations. The winds can cause devastating damage, including to well-built framed homes, in the vicinity of landfall. 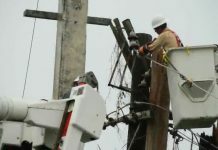 Electricity and water may be unavailable for several days to weeks after the storm. Those living near the coast should be ready to evacuate and heed all warnings issued by officials. While AccuWeather meteorologists are warning of a devastating landfall, there is one scenario where the center of Idai may stop short of reaching the coastline. However, destructive winds can graze the coast and storm-surge flooding may still occur if this solution pans out. If Idai moves onshore as anticipated, land interaction should cause the cyclone to rapidly weaken. Regardless, flooding rain and damaging winds may still spread across more of inland central Mozambique this weekend. Any additional heavy rain from Idai later this week or this weekend can quickly renew or aggravate flooding where the storm moved through last week. Before Idai strengthened into a tropical storm, it made its first landfall into central Mozambique as a tropical depression last week. Heavy rain swamped the provinces of Zambezia and Tete, leading to the deaths of seven people with more than 4,000 others displaced. The demise of Idai, however, may not come this weekend. Even in this scenario, Idai is likely not to be as strong as this week. That may lessen the risk of destructive winds along its future path next week, but flooding downpours can remain a concern. Cyclone Idai, a Category 4 hurricane equivalent, will go down as one of only three major (Cat 3-5) cyclones to ever make landfall in Mozambique, Africa. This topic contains 1 reply, has 1 voice, and was last updated by Strange Sounds 1 month ago. It’s now Red Alert in Mozambique!